They say that a picture can convey a thousand words, right? However, if this statement is a valid one, can you please tell these same pictures to just shut the f*ck up! Or else I will come round to there houses, and damage their frames. It's not nice to be spoken about you know! Just ask the photographer, Rankin, as seen in this one hour documentary produced by the BBC in 2012. 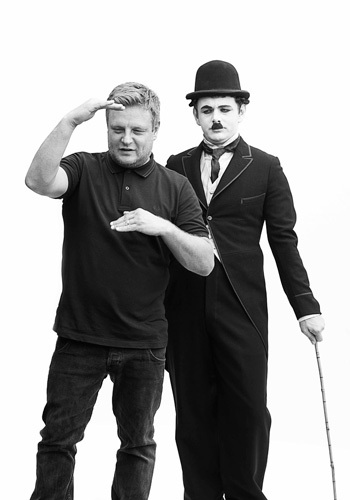 World renowned photographer, Rankin, is on a mission. No, he does not want to kill a celebrity. Instead, he just wants to shoot one - with a camera of course. You see, Rankin, and his top-class gaggle of cosmetic professionals, are attempting to recreate the imagery of Hollywood's heyday. And to do this, they are going to pluck a celeb, touch them up, sit them down in front of a camera, and then click-click-click until the cows come home. Charlie Chaplin: London born Charlie Spencer Chaplin, set the world of film ablaze, when he created his screen persona of 'The Tramp' in the 1920's. Today, Rankin has got his hands on English character actor, Michael Sheen, and attempts do this loveable scallywag some justice. Greta Garbo: Also in the 1920's, photographer, Clarence S. Bull, took some very memorable photographs of the picturesque Madame of the movies, Greta Garbo. However, Rankin currently needs some much needed advice from vintage camera expert, Mark Veljovic, to do the same thing with comely comedic actress, Leslie Mann. Jane Russell: In 1943, director, Howard Hughes, had some very scandalous publicity stills taken of the nineteen year old vixen, Jane Russell, for his film 'The Outlaw'. So guess what Rankin wants to do now with his girl-pal, Tulli, a studio full of hay, and some additional advice from Mark Veljovics? Jane thinks that it is a good idea. Marlon Brando: In the 1950's, Marlon Brando paved the way for all method actors everywhere, by playing it 'for real' in front of the camera. And I suppose you can say the same thing about Rankin and his actor pal, Matthew Reece, as well. Faye Dunaway: The day after Fay Dunaway won her Oscar in the seventies, English photographer, Terry O'Neil, took a leisurely snap of her laying on a chair by the side of her pool. Rankin is positive that he can do the same thing with Hellboy star, Selma Blair, just without the little golden man. On a side not, during these celebrity snaps, Rankin goes around Hollywood and discovers the real life stories of such people as Marilyn Monroe, as well as how tabloid photography has evolved within the media over the years. OK, I have to admit, I was not expecting to really enjoy sitting down and watching 'Shooting the Hollywood Stars' all that much. You see, personally speaking, I always found the tabloid glossies very overt at times, too cosmetic - too smoke and mirrors - and too fake. Well, come on, lets face it, who hasn't taken a good look at a shiny picture of a semi-naked celebrity before, and just thought to themselves that one word misnomer 'Photoshop'. Rankin: At first, when Rankin stepped onto the screen, I honestly thought to myself that he was a bin-man waiting to take out the refuse. Though, once this program began to rock-n-roll, I really did start to warm up to this chap from Hertfordshire quite a lot, because I could associate with his passion for the movie history and the Hollywood of old. In many ways Rankin reminded me of an old mate of mine from college, called John. John was a very earthy and well meaning chap all in all, and he had that way about him which was very personable and focused at the same time. Rankin does likewise, and expresses' it through his strive for perfection, and the detail in what he does. Honestly, for me, this is what I love to see - someone who is willing to try anything just for the sake of experience and knowledge. The Celebrities: Now out of all the famous people on offer in this program, I personally thought that Michael Sheen, Jane Russell, and Leslie Mann, were the stand-out stars overall. I just found them to be very intriguing as people, and would be someone I could learn from with their acting savvy. Please note, this is not to say that Tulli, Matthew Reece, and Selma Blair weren't great as well - as I especially thought that Tulki was a real trouper to pose in that awkward position for all that time she did. It's just that they exhumed a less acting-like prowess in their portraits is all. The History: My favourite sections out of 'Shooting the Hollywood Stars', were those scenes which entailed some historical fervor and back-story. For example, that whole piece focusing on Marilyn Monroe was very eerily with the benefit of modern day hindsight. Plus that section in how 'Vanity Fair' has tried to stylize their publications with a more vintage panache, was interesting from a design point of view. Moreover, the two expert camera men were really great to boot. I particularly liked the scene were camera expert, Mark Veljovics, tried to help Rankin recreate 'the Outlaw' photo. As well as listening to Terry O'Neil speak about his time as a fledgling photographer - very two-and-eight. So what do think of my review Rankin? Give us your spiel. For more about Rankin, please have a look at his website, rankin.co.uk. It's great, just like this documentary.